Each year as February comes around it’s hard not to view the month as a bit of a sporting lull. 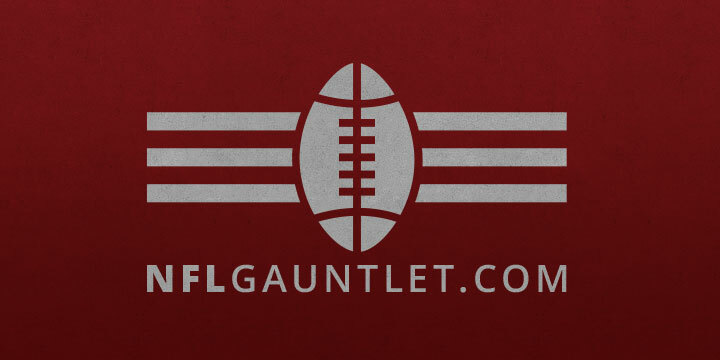 The NFL season is over, baseball spring training isn’t quite here, and we are still a month away from March Madness. As for the NBA, there are some good games to catch but there are a lot of teams still playing cruise control basketball (see the Lakers). Thankfully, we have the NBA All Star weekend to look forward too. My favorite event of the weekend isn’t the All Star game itself, but the Saturday night before it when we get to see the league’s best dunkers (if they choose to enter) show off their hops and creativity in the NBA Slam Dunk Contest. Much like the game of basketball itself, the dunk contest has evolved since it’s inception…and devolved in some ways too. The creativity level and sheer athletic power we see today is almost unbelievable. Unfortunately over the past few years we’ve seen an increasing number of gimmicks and props that don’t add anything to the dunks. In my opinion the dunk contest has seen a huge drop in awesomeness since Jason Richardson’s final appearance in 2004. But in an attempt to be glass half full, here’s to hoping the trend reverses itself this year! -In 1986, Gerald Wilkins jumped over a chair in his round two dunk. This was the first use of a prop in a dunk contest. 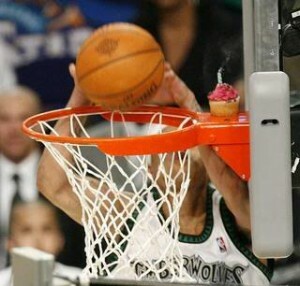 I have a feeling that if Gerald would have known that his use of a prop would one day lead to a guy putting a cupcake on the rim, he would never have done it. I hope he has been punished accordingly. -Terence Stansbury loved to throw the ball up in the air after he jumped. Sounds cool, but the video says otherwise. 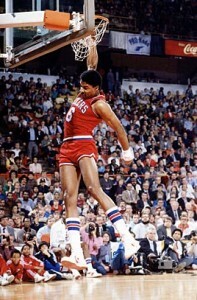 -Dr. J, not Michael Jordan, was the first man to do the free throw line dunk. Jordan’s is more iconic, but it wasn’t first. -In 1990, round 1, Billy Thompson was the first guy to dunk two basketballs. The feat has been repeated, but not often. 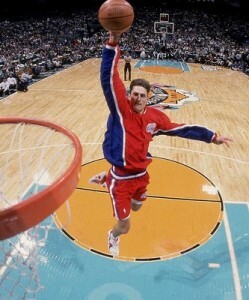 -Rex Chapman was the first white guy to be in the dunk contest, in 1990. Brent Barry, somehow, was the first and only white guy to win the contest. -From what I can tell, Kenny Smith was the trendsetter for the self alley-oop style dunks. His timing was spot on, and had to be, for a lot of his dunks. -In 1991, Dee Brown took a second to pump up his Reebok Pumps. Nike has never had that kind of moment. 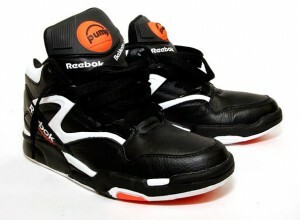 -In 1994 the format was changed and players had 90 seconds to complete three dunks. This led to a lot of jumping but not dunking. -1995 could be called the year of the “throw the ball high in the air and catch it off the bounce”. Many did it, few make it look cool. -In 1998 and 1999, the dunk contest was not held. In it’s place? The worst thing in all of sports, ever, called 2-Ball. Featuring a mix of WNBA and NBA players, I’m not even linking to anything related this because it was probably the worst thing I’ve ever seen. -2000: The year of Vince Carter. Pretty much sums it up. -I don’t remember Vince Carter missing a single attempt when he put down some of the dunk contests best dunks of all time. Since then it is not uncommon to see players attempt the same dunk several times before actually getting it. Unless someone can put it down first try like Vince did on every dunk, no one will ever touch him. -If you look at the judges scoring trends, you can see that 50’s get handed out since the mid 2000’s like a drunk sailor hands out cuss words. It’s become really ridiculous. I know it’s for entertainment, but a little more discretion by the judges would make the contest more suspenseful. Dunking experts? I think not. -Case in point of the above, in 2008 Dwight Howard was awarded four 50 point perfect dunks. One of those dunks, maybe, deserved that score. The rest were low 40’s dunks at best. 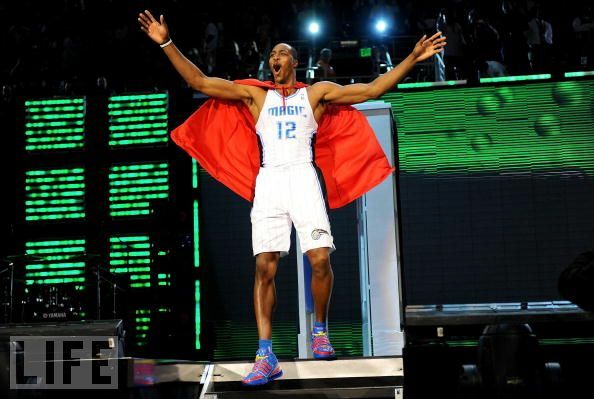 Just do the dunks, Dwight. -In 2009 we were witness to the biggest dunk contest screw job ever. Rudy Fernandez threw down dunks in the opening round that were by far the best, yet he didn’t even see the second round. Here is his first dunk and here is his second. I’m not one to throw the race card around, but I have a feeling that if Rudy weren’t a white European dude he would have been given two 50’s. -Every year that Kenny Smith has called the dunk contest, he has at some point said something along the lines of “that’s it, I’m going home, I’m done with basketball, etc.” in response to a spectacular dunk. You sir, Kenny Smith, are a liar. With the notes out of the way, here is my extremely biased list of my top twenty dunk contest dunks of all time! 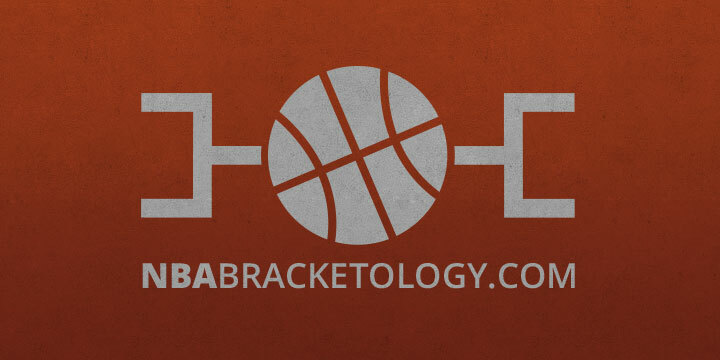 Make sure you go to http://hoopism.com/?p=961 to follow along with my list. 1) Jason Richardson, 2003, Round 3: Talk about a way to finish a dunk contest. Richardson caught the ball off the bounce with his back to the rim. Instead of just throwing it down right there, he decided to go between the legs the hard way and then stuff it through with his left hand. Vince Carter may dominate the top ten, but J-Rich has the best dunk. 3) Vince Carter, 2000: Round 3: Back again, this time Vince goes up for what seems like a fairly standard one handed dunk. But Vince does not disappoint and he ended that dunk by putting his arm through the rim and swinging there from his elbow. Huge marks for the originality of this dunk. 4) Vince Carter, 2000, Round 1 (dunk 3): Vince Carter’s lone dunk contest appearance wasn’t considered the best showcase of dunks ever for nothing. Here Vince finishes up round 1 taking a pass off the bounce from his cousin and lifetime underachiever Tracy McGrady. Vince takes the pass mid-air, goes between the legs, and puts it home. As he’s walking away from the hoop he mouths to the camera “it’s over” and crosses his arms. Yes Vince, it is. 5) Michael Jordan, 1985, Round 3: I was tempted to knock this dunk down a few pegs because Jordan was rocking a puka shell necklace, but the dunk itself scores some big style points. Jordan went from one side of the hoop to the other, rocking the ball in a cradle like he’s trying to put it to sleep. The little freeze he does with the ball right before jamming it was slick. 6) Dominique Wilkins, 1984, Round 1: Dominique makes his first appearance on the list. If raw dunking power was worth more points in my mind, he’d be all over this top 10. Here Dominique does a nice 360 and rocks the ball behind his head with both hands before coming down with a vicious two-handed dunk that would have severely injured anyone in its path. 7) Julius Erving, 1984, Round 3: Michael Jordan seems to get recognized for his free throw line dunk more than any other player but kids, we must learn our dunk history. 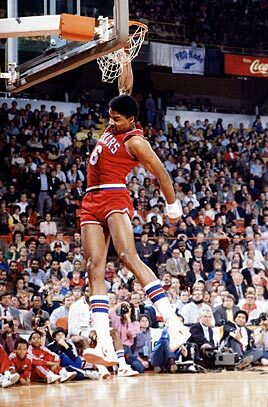 Dr. J was the first man to do this dunk in competition and that dunk has been imitated about every year since. There’s something poetic about seeing Dr. J with the fro and the old 76ers jersey flying through the air. We could do without the nut hugger shorts, however. 8) Jason Richardson, 2004, Round 1 (dunk 2): Somehow, most likely conspiracy, Jason Richardson was robbed of a dunk contest three peat as he lost to Fred Jones this year. Maybe he should have saved this dunk for the final round because it was sick. Off the backboard to himself, between the legs, and finishing with a side arm style dunk. Watch this dunk and then watch Fred Jones’ first round dunk. 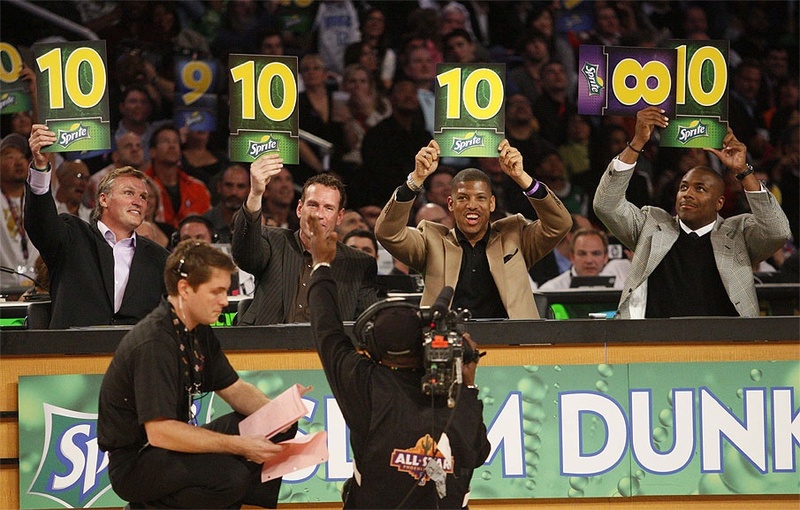 Both dunks scored 50. Explain to me how that is possible. 9) Jason Richardson, 2002, Round 1 (dunk 1): J-Rich had such a great three year run in the dunk contest, that it would have been a crime for him to only make the top 10 twice. Here Jason goes 360 with a two-handed willmill to finish things off. What’s really impressive to me is that he gets about a three step take off. Some of these guys get a running start from the next county, but Richardson just needs a few feet. 10) Spud Webb, 1986, Round 3 (dunk 2): When you watch this video, you may think that Spud Webb looks like a little, muscular kid. He does, but he dunks like a man. The difficulty level of this dunk was pretty high. He didn’t just throw it off the backboard, he slammed it off the court, the ball hit the backboard, and all 5 foot 7 inches of Spud went up high after it and slammed it home. Impressive dunk all around. 11) Nate Robinson, 2009, Round 1: Sticking to the little man theme, Nate Robinson became Spud Webb reincarnate. There’s something impressive about seeing these small dudes fly like they do. Add that to the difficulty of this dunk, catching the ball off the bounce, and doing a two-handed windmill dunk is hard no matter the size of the dunker. 12) Andre Igoudala, 2006, Round 3: This was the dunk contest’s first behind the back wrap-around dunk, and the fact that Andre did it off the bounce made it all the more impressive. If you are sitting there thinking it looks easy, take an object and pass it from one hand to the other behind your back. Now try it in mid-air and slam the object into your trash bin before landing. You just broke an object while realizing that it’s hard. You’re welcome. 13) Josh Smith, 2005, Round 3 (dunk 2): While little guys doing dunks looks impressive, sometimes big men doing impressive dunks looks less so because of their size. This dunk by Josh Smith, however, was a great dunk. He wasn’t the first to do a 360 with a windmill (see Carter, Vince), but he added some extra flair to the dunk with a leg kick. And we know the manager of Chotchkie’s loves extra flair. 14) Isaiah Rider, 1994, Round 3: The between the leg dunk has been better and with higher degrees of difficulty, but Rider was the first guy to do it in a dunk contest, so he gets credit for that. Sadly, winning the dunk contest is probably Isiah’s greatest accomplishment considering life after the NBA hasn’t been going so smooth for J.R. Kidnapping and domestic violence charges, grand theft, auto theft, assault, controlled substance possession, and worst of all, he recorded a rap song titled “Junk in the Trunk”. 15) Fred Jones, 2003, Round 3: Although I don’t think Fred Jones should have won the 2004 dunk contest, this dunk was definitely worthy of the 50 score it received. He did sort of a 180 and grabbed the ball in the air. The impressive part was how far back he reached for that ball. We’re talking full extension reach back and he couldn’t have gone back much farther and still made the dunk. 16) Harold Miner, 1993, Round 3 (dunk 3): If you played any NBA Jam back in the day, you probably threw down some nasty dunks with Harold Miner (and of course had Glen Rice sniping 3’s). This dunk by Miner is the definition of a cradle dunk, and he threw in the 360 spin for good measure. The early 90’s was somewhat of a dunk contest dry spell, but Miner certainly had some great dunks. 17) Kenny Walker, 1989, Round 1 (dunk 2): Hard to leave out a guy with the nickname of “Skywalker”. Walker was another one of the many 80’s dunkers who were apparently pissed off at the rim for some reason and took out a lot of anger on it. Skywalker does some sort of spasm in the air, and if you can get past the knee length compression shorts under the extremely short short’s, this dunk is nice. 18) Kenny Smith, 1990, Round 2 (dunk 1): Kenny “The Jet” Smith’s dunk itself wasn’t that impressive, but the approach was. With his back to the basket, Kenny bounced the ball backwards through his legs, off the backboard, and he caught the ball midair for the reverse slam. A high degree of difficulty lands Kenny in the top 20. 19) Shawn Kemp, 1990, Round 1 (dunk 1): Shawn Kemp was a powerful dunker who liked to take off from two feet, similar to Dominique Wilkins. In this dunk Kemp threw the ball up to himself, caught it in the air and put down a forceful windmill dunk. Kemp’s powerful dunks were more impressive in games as he dunked on just about everybody. Unfortunately, his career was also cut short and he’s had a downfall since then. On a positive note, he has thirty kids, give or take a few, and odds are one will have the slam dunk gene passed on from Shawn. 20) Desmond Mason, 2003, Round 1 (dunk 3): Mason was a very good dunk contestant who was overshadowed, like so many others, by Jason Richardson’s greatness. This dunk showed off Mason’s leaping ability. He seemed to pause midair before going between the legs and reaching across his body for the one-handed power dunk. This entry was posted in NBA and tagged all star game, andre igoudala, billy thompson, brent barry, dee brown, desmond mason, dominique wilkins, dr. j, dunk contest, dwight howard, fred jones, harold miner, isaiah rider, jason richardson, josh smith, julius erving, Kenny Smith, kenny walker, michael jordan, NBA, rudy fernandez, shawn kemp, spud webb, terence stansbury, Vince Carter. Bookmark the permalink. c’mon Pat, that first Rudy Fernandez dunk was very basic, and if I recall correctly it took him many attempts to get that second dunk down. He got the scores he deserved. lol @ not having any of Kobe’s dunks in your top 20. You know his East Bay Funk was better than J.R.’s!